Poliester water tanks are produced with combination of fiberglass and poliester resin. These water tanks have long useful life. Water tanks are also repairable for all defects that can be occured. The production of poliester water tanks have been proceeding by Izoplas, since 1984. With our experience and alternative tank solutions, you can supply your water tank with best quality. These tanks are more durable and have more useful life than other tank types. The main advantage of poliester tanks is could be produced in different dimensions for same product. Poliester tanks could be repaired. After than repairing process, tanks provide required strength. 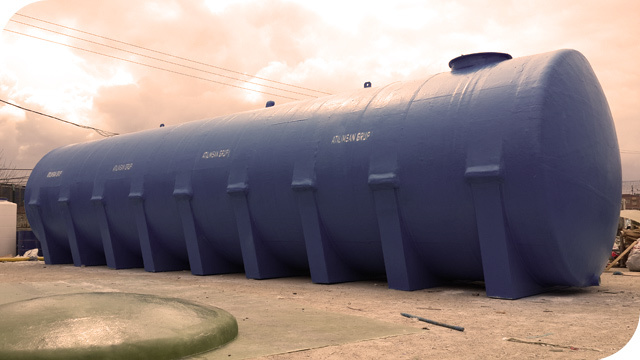 Tanks could be produced as horizontal or vertical for maximum volume that you demand. Tanks are durable against to sunshines. Don’t be covered in moss. For all dimensions, poliester tanks provide you the best solution. Poliester water tanks are formed from 4 parts. This part is produced according to demanded volume of tank. Body part is produced as flat and made cylindrical. All cover parts have a specific mold for all widthness. We produce tank covers according to the demanded tank’ widthness. Legs are required just for horizontal tanks. We designate quantites of legs according to tank volume and tank length. Legs are important for tank balance. Poliester water tank have 2 equipments on it. First one is the tank manhole for filling of tank and controlling of tank. The other equipment is the outlet valve. After production of all these parts, compounded to each other. Tank will be cleaned and painted against to UV after compounded process. Poliester water tanks have warranty for 5 years against to production defects. You should install your tank on concrete ground. It is important for tank’ useful life. For horizontal tanks all legs should step on concrete ground. For vertical tanks, bottom side of tank should step on concrete ground. Don’t lift your tank when it is full. Don’t lift your tank from its outlet valve or tank manhole. Don’t interfere over tank with any driller or cutter equipment. You clean your tank in annual periods for longer tank useful life.